How to Create an Image Slideshow In YouTube? 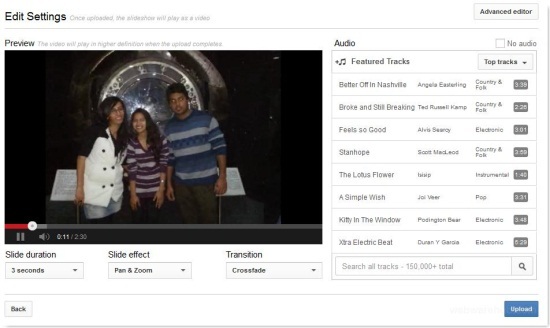 YouTube recently introduced a new feature that allows you to create image slideshow videos. Previously, the situation was not same and much more efforts were required to accomplish this task. You required creating a slideshow video on your PC using some video application such as Windows MovieMaker. Anyway, that is past and you don’t have to bother about all that. Go to Youtube.com and login to your account. Then click on ‘Upload’ button placed adjacent to video search bar on top. 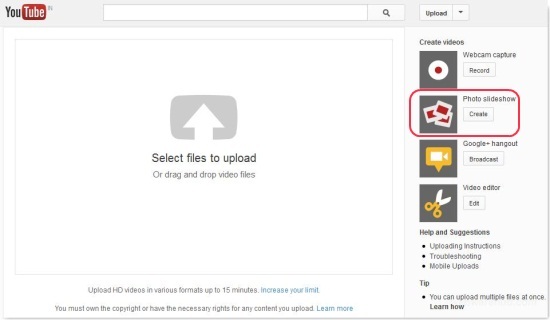 Then you will be taken to YouTube’s video upload form and your task will be to click on ‘create’ button. 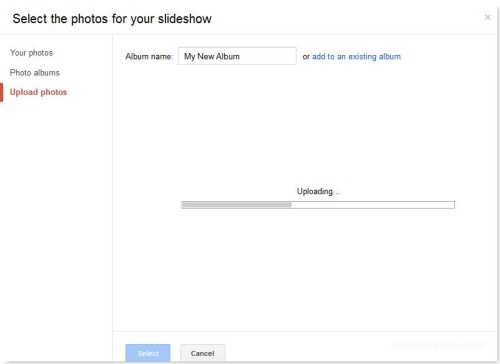 Next, you will be prompted about adding images for creating the slideshow. There you will be provided with options to include your images, images from your photo albums, or to upload them from your PC. The list of images will be presented to you after successful uploading. You can preview them and remove the images that you don’t want to include in the slideshow. To proceed you will require clicking on the ‘Next’ button. In no time you will be redirected to another webpage for specifying the details like time delay, type of transition, and the audio track to play in background. In the panel to the right you will find audio tracks to be utilized in background. In case, you wan’t something more specific then the search box at bottom can be used for querying the desired track. If that was not sufficient then click on ‘Advanced Editor’ to customize the order of images and adjusting a few other attributes. Finally, you can click on ‘Upload’ button and within few seconds you will be prompted about specifying the title, description, tags, and privacy for the new Video. Do note that it may require a few minutes for processing to complete and for your Image Slideshow to become visible online. I tried with about 25 high quality images and it took 5-7 minutes. The only limitation is regarding the lack of any option to include a custom sound track. The tracks available on Youtube are good, but might not suit for every occasion.